AbbVie (ABBV) was spun off from Abbott Laboratories (ABT) in 2013 as a standalone biopharmaceutical company focused on four primary therapeutic areas: immunology, oncology, virology, and neuroscience. The company's drugs treat conditions such as chronic autoimmune diseases in rheumatology, gastroenterology, and dermatology; oncology, including blood cancers; virology, including hepatitis C (HCV) and human immunodeficiency virus (HIV); neurological disorders, such as Parkinson’s disease and multiple sclerosis; metabolic diseases, including thyroid disease and complications associated with cystic fibrosis; as well as other serious health conditions. The company's blockbuster arthritis drug Humira accounts for approximately 60% of sales and an even greater share of AbbVie's profits (70%). In order to diversify away from Humira, which accounted for nearly all sales and earnings at the time of its 2013 spin-off, AbbVie has focused on numerous other fast-growing blockbusters including leukemia drug Imbruvica (11% of sales), hepatitis C drug Mavyret (11% of sales), and new cancer drug Venclexta (1% of sales but growing rapidly). In total, the company generates more than $32 billion in annual revenue and sells its drugs in over 170 countries (about 35% of sales are in international markets). Adjusting for its spin-off from Abbott, AbbVie is considered a dividend aristocratdespite paying growing dividends for just six consecutive years as a standalone business. The branded pharmaceuticals industry has high barriers to entry and offers the potential for excellent profitability. In fact, AbbVie generates an operating margin north of 35% today. Major pharma players invest billions of dollars and years of time in research and development to commercialize breakthrough drugs. While the success rate is low (around 90% of drugs fail), a successful drug can generate billions of dollars in monopolistic profits that are protected for many years thanks to the intellectual property owned by the manufacturer. Medications are also recession-resistant products because consumers still need to treat their illnesses regardless of how the economy is doing. However, many pharma companies still have less predictable business models compared to other types of businesses. Their protected drugs will eventually lose market exclusivity and see their sales quickly erode as competitors launch rival products. As a result, these firms must develop or acquire new drugs to replace those sales, or else they can see profits erode. Despite the industry's challenges, AbbVie has done an admirable job maintaining a steady pace of double-digit growth in its top and bottom lines since becoming an independent company in 2013. The company's historical success is largely thanks to immunology drug Humira, which has been the best-selling drug in the world for years. AbbVie has had success growing Humira by continually obtaining new FDA approvals for expanding the conditions it treats. For example, today Humira is a top choice for not only treating Rheumatoid Arthritis but also Psoriasis and Crohn's Disease. And since Humira continues to enjoy patent protection in the U.S. (its biggest market by far) through 2023, the drug's sales translate to very high margins, helping to lift AbbVie to some of the best overall profitability in the industry. AbbVie has about 70 patents that protect everything from the drug's manufacturing process to how it gets delivered to patients. As a result, AbbVie has managed to keep biosimilar rivals out of the U.S. via six licensing deals with major drugmakers looking to launch Humira biosimilars in America. And even after AbbVie loses patent protection on Humira (which has already happened in the European Union), the efficacy and solid risk profile of that drug are why analyst firm EvaluatePharma expects Humira to remain the best-selling drug in the world through 2024, with annual sales of about $15 billion that year. That being said, a blockbuster drug like Humira is also a double-edged sword because it attracts numerous rival drugmakers who want to launch similar products targeting the same conditions. It also creates high dependency on just a single sales and profit source, which can create more volatile results in the future, hardly something that conservative dividend investors want to see. When rival drugs do finally hit the market, then sales can decline rapidly. AbbVie experienced this in 2018 when Humira faced biosimilar competition in the EU, driving its international Humira sales down by nearly 15% in the fourth quarter. Outgoing CFO Bill Chase told analysts on the fourth-quarter 2018 conference call that the company expects a 30% decline in 2019 international Humira sales due to continued market share (and pricing power) losses for the drug. If AbbVie's projection holds true, international weakness will more than offset the expected 7% growth in U.S. Humira sales, resulting in the first annual decline in global sales of the drug since its launch. It also means that global Humira sales will have peaked at $20 billion, not the $21 billion management had previously anticipated. 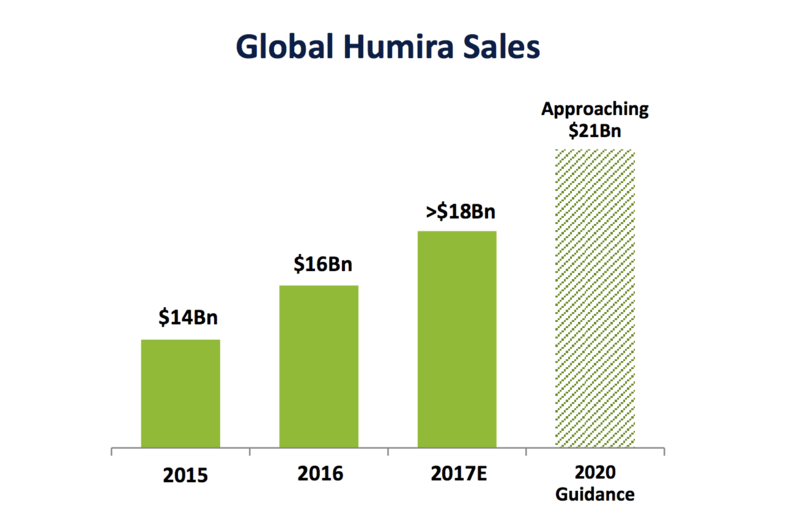 Even more worrying to investors is what CEO Rick Gonzalez told analysts about the outlook for international Humira sales going forward"
"As far as other countries in 2020, the majority of the volume doesn't come under additional biosimilar exposure in 2020. The more significant countries are in 2021. So, there is some, but the majority of it occurs in 2021, not in 2020." Analysts expect that a steady stream of patent losses in the coming years will lead to global Humira sales declining by 20% to 30% in each of 2019, 2020, and 2021. Shortly after, in 2023, AbbVie loses patent protection in its home market which will likely lead to another substantial decline in sales and market share. Yet despite the major challenges facing Humira, which weighed on the stock throughout most of 2018, management is still guiding for about 1% revenue growth in 2019, and 10% adjusted EPS growth. About 300 to 400 basis points of that bottom line growth will come from buybacks, but the rest is driven by an expected uptick in margins thanks to cost-cutting initiatives and lucrative royalty payments from Humira sales in the EU. AbbVie, like all drugmakers, has used strategic M&A to expand its drug development pipeline. One of its most notable deals came in 2015 when the firm paid $21 billion to acquire Pharmacyclics, giving it blockbuster cancer drug Imbruvica. 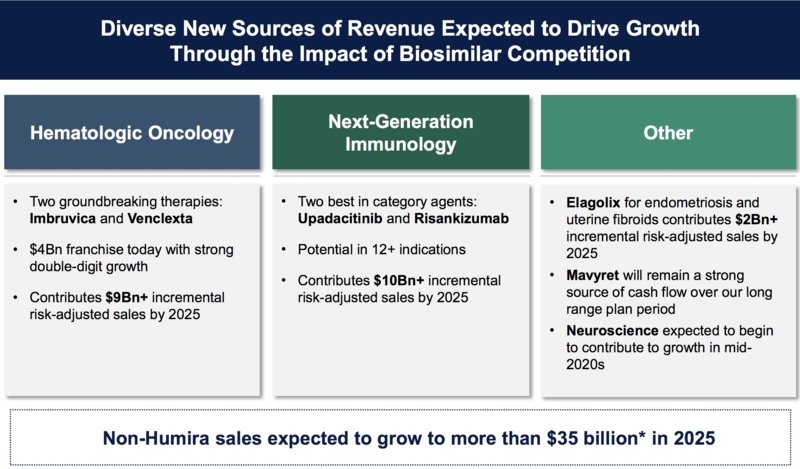 Research firm EvaluatePharma believes that Imbruvica sales could climb from $3.6 billion today (11% of AbbVie's total revenue) to as much as $9.6 billion in 2024. In addition, AbbVie has focused on other promising oncology drugs since not only is this therapy area the largest in the industry, but it also has one of the fastest growth rates, according to EvaluatePharma. Over the next five years, cancer drugs are expected to grow to represent about 20% of all global drug sales, which is one reason why AbbVie is so excited about blood cancer drug Venclexta. Some analysts believe this drug could see its annual sales rise as high as $3 billion over the next few years, up from $344 million in 2018. To achieve that growth, AbbVie has invested to expand the kinds of cancer Venclexta can treat. Thanks to these efforts, management expects the drug's sales to double in 2019. The strategy is similar for Imbruvica, with a number of indication expansions planned for the drug in the years ahead. 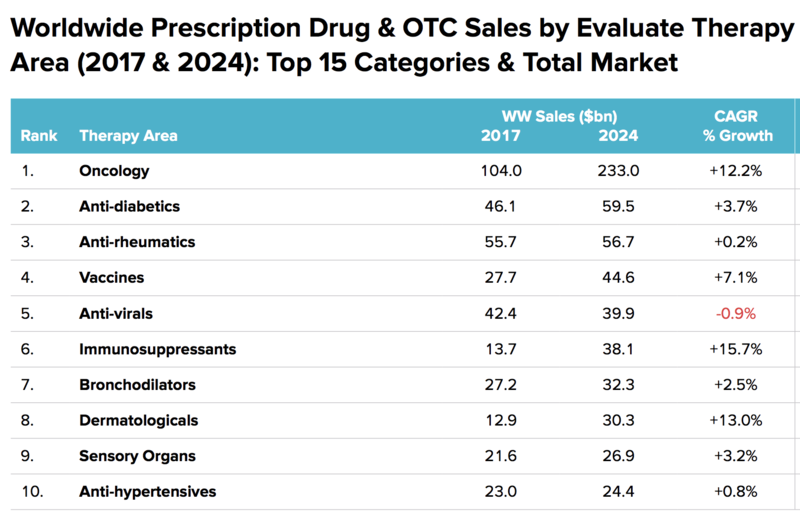 Combined, these businesses are expected to contribute $9 billion in incremental sales by 2025 (compared to AbbVie's 2018 revenue of about $32 billion). However, AbbVie has built its current empire on immunology (Humira), and it doesn't plan to abandon that part of the market either. In fact, management expects next-generation immunology drugs to deliver at least $10 billion in incremental sales by 2025. "We are now confident that with Risankizumab ("Risa") and Upadacitinib ("Upa"), we have accomplished our objective. Both of our next-generation immunology therapies have demonstrated across multiple clinical trials superiority versus Humira and other competitive offerings... In our hands, these assets have the ability to become the new standards of care in immunology. We expect to launch both Risankizumab and Upadacitinib in 2019, and based on their profiles, anticipate broad formulary access." Risa is expected to be approved in the first half of 2019, and Upa in the second half of the year. Combined, these two new drugs are expected to ultimately generate $10 billion to $12 billion in annual sales. Along with several other drug launches, AbbVie believes it is well on its way to achieving its long-term Humira diversification goal. All told, management believes that by 2025, even adjusting for risks of drug trial failures (which all drugmakers deal with from time to time), non-Humira sales alone will be at least $35 billion, or 10% above the company's total 2018 revenue. Even adjusted for faster than expected Humira declines by 2025, management expects global Humira sales to still be about $11 billion. Thanks to its strong drug pipeline, AbbVie's growth potential over the next five years appears to remain solid despite its heavy dependence on a peaking Humira. While AbbVie's current Humira concentration remains a big risk, the firm's plans to leverage its large pipeline of potential blockbuster drugs could still make AbbVie an interesting dividend growth investment for some investors who are comfortable with these uncertainties. However, AbbVie, along with most other drugmakers, still has a complex risk profile. While AbbVie's growth engine appears to be firing on all cylinders, investors need to keep in mind three major risks. First, while AbbVie has made some great acquisitions, the firm has also faced its fair share of failures. Most notably was its 2016 acquisition of Stemcentrx for $10 billion. That debt-funded deal increased the company's leverage to one of the highest levels in the industry. Worse, the cancer drug AbbVie bought, Rova-T, suffered major drug trial failures that resulted in its peak annual sales potential falling off a cliff. As a result, EvaluatePharma cut its net present value of that drug (based on discounted future cash flows) by 98%, from $8.5 billion to less than $200 million, making Rova-T the biggest major drug failure of the past year. AbbVie has admitted as much with a $4.6 billion write-down on the Stemcentrx acquisition. This event highlights just how tricky acquisitions can be in this industry because management has to estimate the risks of a potential target's drugs failing to reach the market, as well as approximate how high peak annual sales might be. Since both figures can only be estimated, the potential for mistakes is higher than in most other industries. Fortunately, on the company's fourth-quarter 2018 conference call, management made it clear that AbbVie has no plans for big acquisitions, except in cases where it is highly confident it can obtain another blockbuster drug. As CEO Rick Gonzalez explained, "If we could find another Imbruvica or we could find another Risankizumab out there, I can tell you we would aggressively pursue that." For now, AbbVie's growth focus is completely on its promising pipeline, which should minimize M&A risk (and allow it to deleverage its balance sheet). Another risk to consider is that long-term dividend growth investing requires making some assumptions about how fast a company's cash flow and payout can grow. In the pharma industry, with its hamster-wheel-like sales cyclicality created by patent cliffs and drug trial failure risk, this can be especially challenging. Forecasting is only made more difficult by the wide range of estimates for how well any particular blockbuster drug might do. For example, AbbVie's Orlissa has peak sales estimates ranging from $1 billion per year to $3 billion. Imbruvica estimates range from $6 billion to nearly $10 billion. For a company that hopes to generate $45 billion or so in annual sales in 2025, having two drugs whose potential peak sales ranges range from $7 billion to $13 billion shows just how hard it is to estimate a company's sales, earnings, and dividend growth. Not surprisingly, analyst estimates for AbbVie's five-year earnings growth rate are volatile. For instance, before the Rova-T trial failures, analysts expected long-term earnings growth from AbbVie of 15%, according to FactSet Research. Today, thanks to Rova-T flopping and Humira biosimilar competition being worse than initially expected, those growth estimates are just 10%. With long-term earnings that can swing so wildly over time, valuing a drug company like AbbVie is harder than many other types of businesses that are more predictable and mature. If major drug trial risk, M&A execution risk, and challenging long-term forecasting weren't enough, we can't forget about regulatory risk either. Regulatory changes are an ongoing risk in this industry, especially as government healthcare policy is constantly in flux. The high margins of the pharma industry make it an easy target for politicians to attack, calling for increased regulations to drive down the price of drugs. Of course, most of the time this is just political grandstanding; however, should Medicare and Medicaid be allowed to negotiate for bulk drug purchases (which they currently can't by law), for example, then all drugmakers could see margin compression. Other regulatory risks exist as well. Most recently, the Trump Administration ordered the FDA to accelerate how quickly it approves generic/biosimilar drugs and potentially ban the industry-wide practice of offering big drug rebates (sometimes bundled across several drugs) to insurance companies. Rebates are usually offered to earn preferential treatment on pharmacies' formularies and maintain market share longer once patents expire. The FDA has called this a "rigged system" that drugmakers are benefitting from at the expense of Americans who are paying higher drug prices than necessary. Should the FDA make any major changes to regulations, AbbVie's long-term growth potential could take another hit. The pharmaceutical industry is arguably one of the most challenging areas to invest in due to its many complexities and risks, including constantly evolving drug pipelines, patent cliffs, litigation, fierce generics competition, and regulatory uncertainties that could make future growth harder to come by. 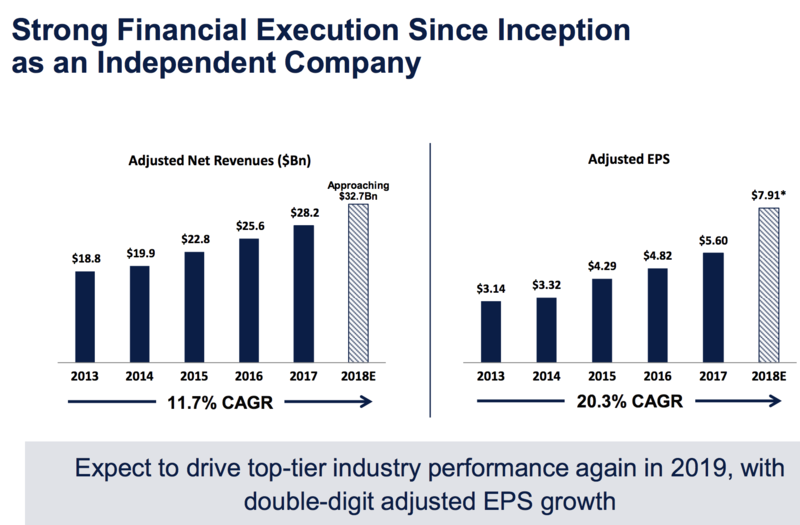 AbbVie's management has admittedly done a solid job navigating the challenging pharma waters thus far, rewarding dividend growth investors with a combination of strong payout increases and total returns since its spinoff. However, it’s still hard to get comfortable with AbbVie’s competitive landscape over the next five years. The key issue for the company is how well global Humira sales hold up now that the drug has peaked in sales and faces a rising number of biosimilar rivals. As an outsider looking in, analyzing this risk and evaluating AbbVie's large pipeline of new drugs that will launch over the next five years is very difficult. AbbVie's growth story could continue playing out as well as management expects, but our preference is to invest in the few companies that share AbbVie's financial strength but also enjoy much more diversified revenue streams, limiting downside risk in the event of any unfavorable developments with one of their drugs. Johnson & Johnson and Pfizer are two examples. Prospects can change quickly (for better or worse) when a company's operations are so concentrated. Income investors considering AbbVie need to keep this in mind and size their positions accordingly (if at all).